is what the proverb is about. It is only one of several useful answers to . The usefulness depends on the surroundings to a great extent. See the end of this page for more. Here's an example. is played to reduce White's framework; is correct shape in reply. -- Charles Matthews. 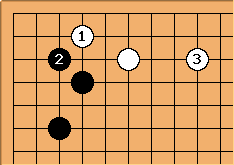 Here's another well-known joseki example of a kosumi response to a keima approach. 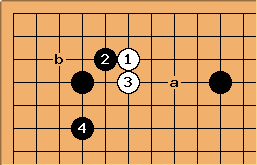 This means to play kosumi (diagonal move) when your opponent plays a keima (knight's move) approach to your stone. Your kosumi will be on the point that the approach aimed at. It also aims at a shoulder hit (katatsuki) against your opponent's stone. Isn't there another joseki when white plays at '1', black responds at the position which white had played '3' and then white will play a hane and the joseki continues...? Random Passerby? 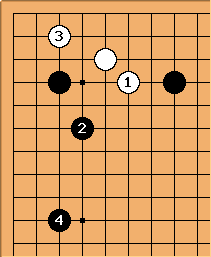 But this, while joseki, is very solid, and is usually avoided. The kosumi-tsuke is good to know, but also relies on the surroundings. You would not typically respond with either kosumi or kosumi-tsuke to a keima kakari. So how come this is a "proverb"? Aside from here, I have seen it only on Jan van der Steen's list, and did not find an explanation there. is a keima response to the kosumi of . That is joseki, also. Bob McGuigan: First, all proverbs have exceptions and are only meant to suggest a proper way to play. The correct move in a situation always depends on the over-all board position. In the preceding diagram is a kosumi but doesn't have the same relationship to the corner 3-4 stone. Also, is not the only joseki response to , there are several "non-keima" possibilities. Bill: Yes, Bob, all proverbs have exceptions, but you could also say, "Answer keima with keima", or any one of a variety of responses. This is not a question of exceptions. It takes some thought to come up with examples where the kosumi is the correct response. This is a proverb????? .Bob: Well I was responding to the previous post. 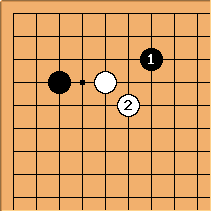 But it is a more-or-less standard shape move to respond to a keima approach (from below) with a kosumi. WHo knows what a "proverb" is exactly anyhow. See also keima slide and ogeima slide.